If you are considering to indulge in some of the top selling machine rolled cigars on the market, consider Black & Mild cigars. Their tobacco is fully flavored with an essence of sweetness. The aroma emanating from Black and Mild machine rolled cigars is so pleasant, pure and delightful that it leaves the smoker with the true understanding of a redolent aftertaste close to that of a hand made premium cigar. Allow yourself to indulge in the magical experience offered by this cigar now while the prices appear affordable and consumer-friendly. Cigar flavors range from fruity Apple to Cream, Vanilla and other exotic aromas. Some of the these machine rolled cigars also feature wooden tips. 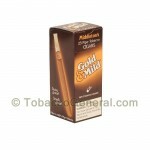 Tobacco General is doing everything to maintain the lowest price online on the Black & Mild cigars variety. Promotional Black & Mild Cigarillos. As with all cigarillos, these do not come with a tip.